1 Bridal Bouquet: 5-7 Terracotta Carnations, 5-6 Sahara roses, 5-6 cream spray roses, 5-7 cream astrantia, sprigs of gunni and leather leaf fern. Pinterest Inspo Pic **I recommend spray painting your leather leaf bronze, gold, or cream with Design Master Floral Spray. Also, adding sprigs of dried grasses or lunaria will really help the vibe! 4-5 Bridesmaid Bouqets: 3-4 Terracotta carnations, 3-4 Sahara roses, 3 cream spray roses, 3-4 cream astrantia, sprigs of gunni and leather leaf fern. Pinterest Inspo Pic. Bouts or Corsages: 1-2 cream spray roses, astrantia bud, sprigs of greens. 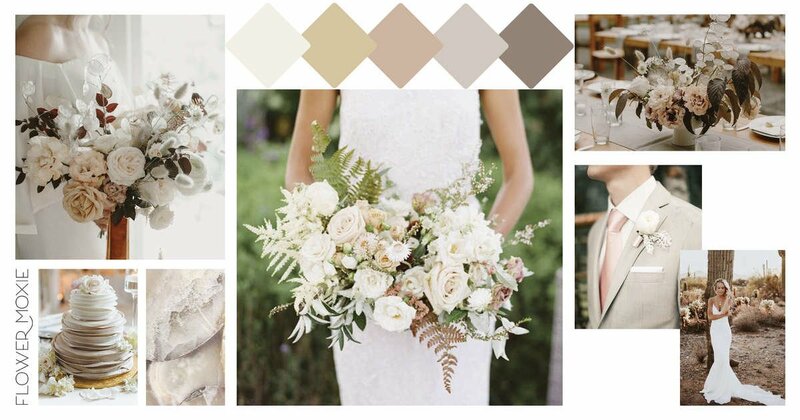 Here's our Neutral Beige Pinterest Board that inspired this combination of flowers. We hand-selected predictable and year-round flowers that will be easy to work with and give you the same or similar vibe that's happening within these moodboards to take the guess-work out of it!